Well, the bits have arrived. Not sure when I will have time to make it. Title got me all hopeful that this would be about ARM assembly language (or even x86). Came from Germany and weights 26Kg! Looks like a roll of fibre there ... so it's your own CPE? They thought that in the office too when they saw it. No, one roll of ABS and one roll of PLA. Could be a big clue ... 3D printing? Where did you get the kit from? I was going to buy one of them last month, but my credit card company had other ideas :). Apparently one can make a lot of the parts of a reprap using one of these. 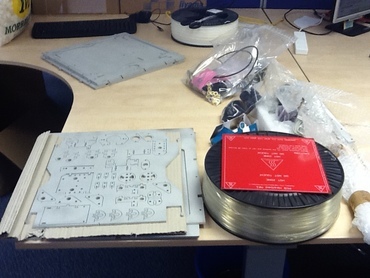 This is a slightly more up-market version of a reprap with some nice water cut metal sheets.